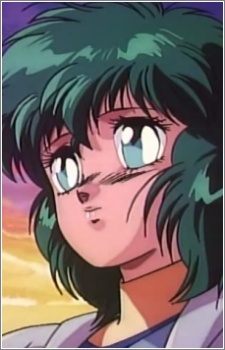 Nagisa is the secondary heroine, and the fourteen year-old partner of Iczer-3. She lives on a lunar colony with her best friend Kawai Shizuka, and works part-time at a fast-food delivery service. When Neos Gold's forces attack, she is at the Moonbase delivering food to the crew of the Queen Fuji (クィーン・フジ號, Kuīn Fuji-gou?). When Fiber takes Kawai hostage, she offers herself instead, and is about to be attacked when Iczer-3 intervenes. From that point on, she becomes a key player in the war against Neos Gold's evil forces. As Iczer-3's partner, she develops a powerful telepathic bond with the gynoid. Shortly after, she also begins to frequently experience strange dreams. These dreams are in fact a flashback to the Iczer-1 OVA, revealing that she is the granddaughter of Iczer-1's partner, Nagisa Kanō. Like her grandmother before her, Nagisa's emotional state is the key to powering Iczer Robo in battle, though it is later revealed that Iczelio Energy (イクセリオ・エネルギー, Ikuserio Enerugī?) is the core power source. She also acts as Iczer-3's guardian while she is on Earth, and when Iczer-1 arrives on Earth, Nagisa seems to immediately recognize her. Likewise, due to her intimate connection with Nagisa's grandmother, Iczer-1 knows Nagisa very well.